Both of my boys are huge Sponge Bob fans and we recently received SpongeBob Squarepants Triple Pack 10. This movie contains 24 of my boys favorite SpongeBob episodes, "Heroes of Bikini Bottom," "Legends of Bikini Bottle" as well as "10 Happiest Moments." The 10 Happiest Moments is awesome, and allows you to see SpongeBob at his finest on different episodes. If you are a huge fan of SpongeBob, then you have probably seen these episodes, but this movie is available on Amazon for less than $7 shipped. This makes it the perfect movie to add to your SpongeBob collection, and my boys love taking in for car rides to they can pass the time. "Look what's come ashore! 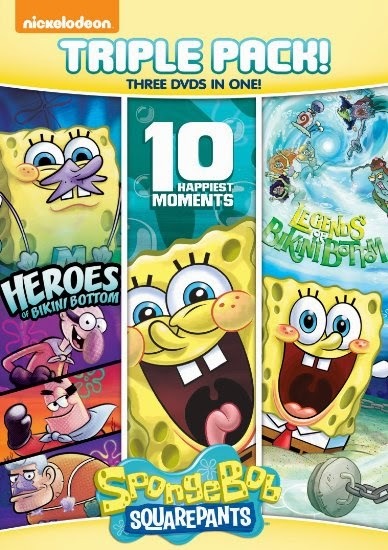 Its a boatload of SpongeBob featuring his happies moments, including getting a job at the Krusty Krab, the deep's favorite superheroes and a spine-tingling legends of the deep!" In total between all three DVDs there is a playing time of 289 minutes! That is hours upon hours of hilarity for your kids (and maybe even yourself) to enjoy! Win It: One lucky winner will receive SpongeBob Squarepants Triple Pack 10. Any episode as long as it has squidward! I entered the botantical splash giveaway. I really like the Band Geeks episode. I really love the movie the best. It never fails to make me laugh. I don't think I have a specific favorite episode I do Love his I'm Ready, I'm ready song though. We love Sponge Bob and we have to agree with the post above--Sailor Mouth was FUNNY!!! I just love that episode and the dolphin noises to cover up the bad words. my granddaughter loves sponge bob. her favorite is Heroes of Bikini Bottoms. I don't watch it close enough to have a favorite episode. I guess my favorite would be the movie that I went to see in the theater that had David Hasselhoff in it. I like all of them but it's been a long time since I've seen it. Been so long since I watched it ... would love to win this to get back into it with my daughter! I have tons, but I really like Squeaky Boots"
My favorite episode is the one about his "Whistling Holes". I don't have a favorite episode. We laugh at all of them. Patrick is one of our favorite characters. I'm not sure about one specific episode but my favorite ones are the ones with Sandy in them. I love the episode with the broccoli stuck in his teeth!! My grand daughter loves Sponge Bob. She would watch it every minute if she could. My favorite episode is the one where Sponge Bob kept playing golf and making holes in his neighbors house until it crumbled down. I entered the band aid giveaway. I love the one where Squidward becomes Handsome! I also like the one where Patrick becomes smart. one I really like is when Squidward has a old friend who is rich and has accomplished something in his life and he asks Squidward what he has done since high school. So he tries to be someone important and make a good impression as a restaurant owner of a fancy restaurant so his friend won't know that he is not as well off as his bragging friend. the episode is called Squilliam Returns. Ripped pants is my son's favorite. I really couldn't tell you an episode...my granddaughter would know. i like the i ripped my pants episode. I can't think of a specific one. My favorite Sponge Bob episode is when Sponge Bob is trying to get his boat drivers license, so funny! I love the ripped pants episode. Me and my niece love the song. I like the Jellyfish hunter episode it's one of my favorites.